NEW YORK, NY -- Sonia Guiñansaca came to the United States from Ecuador when she was 5 years old. At the age of 26, Sonia has spent more than 10 years organizing to push for undocumented immigrant rights in both political and creative spaces. On a recent visit to New York, fresh from a two-week trip to the border near El Paso, Texas, the poet and activist spoke to NBC Latino about what it means to be a formerly undocumented migrant, a queer woman of color and the effects of both physical and psychological borders. What were you doing in El Paso? I work with Culture Strike. It’s an arts and cultural organization of over 200 artists from all over the country. We do a lot of cultural strategy around issues of immigration, borders, detention and climate justice. I coordinated a small group of about 10 to 12 artists to discuss what is happening - a range of topics from migrating to to sexual abuse that happens while crossing borders. El Paso is a pivotal point — it’s not until you go to an actual border you’re like, 'this is horrendous. Mexico is right there.' There is so much theoretical meaning we put on it. You walk there and see other people going about their day. For me, the creation of this man-made border was eye opening for me. This is the thing that has supposedly kept me from going back to Ecuador, this imaginary big border. You were undocumented growing up; at the time did you imagine yourself being an activist and poet? I don’t think so. Growing up, a questioning queer young person and brown, there was sexism and patriarchy that came into play. I had to deal with my parents' undocumented status. One of the reasons why I do the work I do right now is that there is a younger, brown, questionably queer young girl of color who doesn't see herself in a book, movie, documentary or poem. There are amazing writers of color, but there haven’t been any on a larger scale that are migrant, formerly undocumented or documented queer. Being able to apply myself in my surroundings pushes me [so] the next generation is able able to find themselves and to not have to question that they exist or have to question themselves and their identity. You help coordinate Undocumenting.com, a cultural and creative space for undocumented artists, what motivated you start it? I think there’s a larger institutional de-humanizing of undocumented people which goes hand in hand with erasing their right to be able to create and imagine. I’ve been fighting to create spaces for and by migrant and formerly undocumented people. I want to have that access and reclaim and acknowledge that we exist and are creators. I started Undocumenting with fellow co-founder Kemi Bello as a way to profile other undocumented artists. Undocumenting is archiving and highlighting what they are creating. "Poetry is my mechanism at trying to process or put language to the achiness and nostalgia of home that never goes away." There is an understanding of immigration as being particularly brown. A lot of the platforms are cis, straight, brown, light-skinned men or women, or Dreamers. Yes, those are stories, but there are a range of more. People are always surprised when they realize immigration goes beyond the Mexican border. On the second week of May, Undocumenting.com will re-launch featuring all black undocumented artists in an attempt to help start a larger conversation on centering those stories. Do you remember your first poem? I’m pretty sure I was in Junior High School reading about Frederick Douglass. I had a journal and it was prose about being undocumented. It may have been about my father. I had a complicated relationship with my parents. I think at least with my case, when you’re a first-generation immigrant in the United States and you’re the one that knows English, you play the role of mediator between your parents and everyone else. There were instances where my parents were not seen as adults because of their lack of English, and it created this ache that my parents were made invisible. I was always writing down in my journal trying to work it out. You recently gained legal status and returned to Ecuador, what was it like returning after over 20 years? I wanted it to feel like it had paused when I left, but Ecuador moved on without me. My childhood toys had collected dust. All of the people I had wanted to stay alive and welcome me were gone. That’s the immigrant story: hope your elders still alive, but borders stretch far. I’m one of the lucky people to change my immigration status. People there said I looked American. I thought, 'Wait, America doesn’t claim me.' But there they said I was American because of the way I talked with my purple hair. I realized I am a product of American culture. I come from a poor working class family. I still haven’t processed it — talking to other folks about what it’s like to go back home. There’s a saying, you’re not from either here nor there. That’s how it feels. 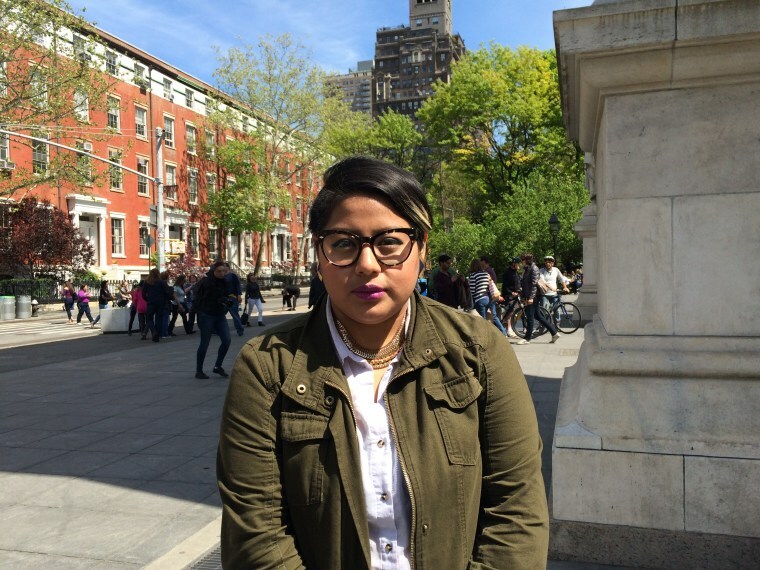 The trauma of being undocumented is never belonging anywhere and always trying to find home. Poetry is my mechanism at trying to process or put a language to the achiness and nostalgia of home that never goes away.